Update Effective March 22, 2010, Neuergus kaiseri has been listed as CITES Appendix I. For discussion, see forum thread. 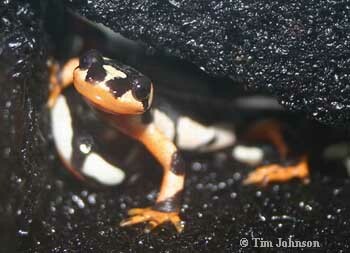 As of 2005, the IUCN Redbook listed N. kaiseri as Critically Endangered. 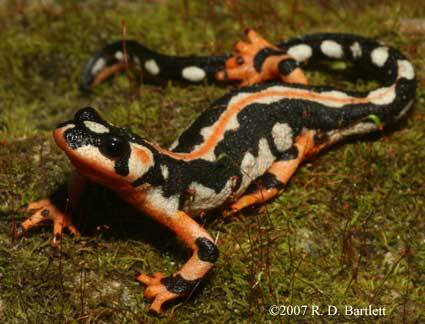 The Global Amphibian Assessment cites the following evidence: "its extent of occurrence is less than 100 km2, its area of occupancy is less than 10 km2, its populations are severely fragmented, and there is a continuing decline in the extent and quality of its habitat, as well as a decline in the number of mature individuals due to overharvesting for the illegal pet trade". It is believed that less than 1000 adults exist in nature. In light of the endangered status of these animals, it is critically important that the animals now in captivity be bred, and that hobbyists resist the temptation to buy wild-caught animals. We hope that this caresheet will help in the establishment of stable captive breeding groups. We encourage all breeders to participate in studbooks and to correspond with other breeders. 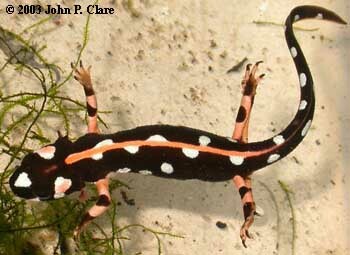 When terrestrial, the newts spend the day under the lower hides and at night will forage for food amongst upper hides and open spaces. They have a preference for perching high and are very active soon after the lights are turned out. The water dish is used frequently and the animals are often seen taking a quick soak. They are very gregarious towards one another and will often be found huddled together under a single hide. Intraspecific aggression is not a problem. The first known captive specimens of N. kaiseri were brought to Europe from field studies conducted in 1970s by father and son Schmidtler and Schmidtler. In the early 1990s, Schultschik and Steinfartz brought some pairs to Europe, from which some descendents are still alive. In recent years (2005-2008) there have been illegal exports of N. kaiseri from the wild into the pet trade. Given the endangered status of the species, it is likely that this distribution of wild-caught animals has had a serious impact on wild populations. Many of these wild-caught animals have died from infections within a short time after purchase. Even before these illegal exports began, there was a studbook maintained by AG Urodela in Germany. It was not very successful, as many CB F1 animals died in captivity. However, some F2 animals have been produced, and studbooks should be maintained to ensure the continuation of the animals now in captivity. 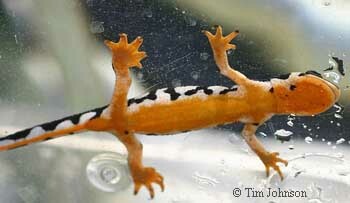 The housing needs of N. kaiseri are similar to those of other newts that migrate seasonally between land and water. When kept aquatic, most keepers opt for a large semi-aquatic setup containing plenty of rocks and hides, both above and below water. Water level can be deep, with levels of 20-30 cm (8-12 in) being typically used. It is unclear whether or not these animals utilize swiftly-moving water in the wild. Thus the filter should produce no more than gentle movement of the water in the tank. 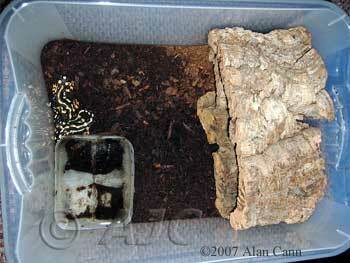 For periods of terrestrial housing, most keepers opt for a soil-based substrate kept on the dry side. The enclosure should be furnished with plenty of stacked rocks or bark. Setups for this species do not need to be misted, and excess moisture may be detrimental. It is recommended that a moisture gradient be provided in the soil by adding water to only one end of the setup. A shallow water bowl provides insurance against drying out, and the animals will often use it. The crevices between the pieces of rock or bark provide the animals with a full range of moisture options and hiding places. Bricks with holes in them are also very appropriate, for both aquatic and terrestrial habitats. Temperatures of between 15-25°C (60-68°F) are appropriate, although this species can tolerate temperatures up to 30°C (86°F) when housed on land. During winter, terrestrial animals have been kept down to near-freezing temperature without ill effect, although this is not recommended due to the risk of freezing. Even at temperatures approaching freezing, the animals remain active and feed. A cold (5-10°C; 40-50°F) terrestrial period in late autumn and early winter seems to stimulate breeding, as is the case for N. strauchii. Terrestrial adults and juveniles are fed small earthworms (whole or chopped), lesser wax worms, large fruit flies, maggots, tropical woodlice, and crickets of appropriate size. 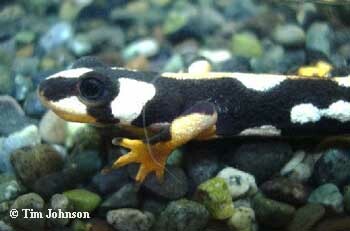 When aquatic, they can be fed the usual assortment of newt foods, such as earthworms, live/frozen bloodworms, etc. They are not picky eaters. A winter cooling period is essential for breeding. The exact temperature and length of time needed to elicit breeding is not known. Although the native habitat of N. kaiseri is generally hotter than that of the other Neurergus, most successful captive breedings have been achieved under conditions nearly identical to those used for N. strauchii. Sparreboom et al. (1999) reported courtship behavior after a winter cooling at 17°C and introduction of the animals into water in February. However, Bogaerts reports that he was unable to breed them under these conditions; the females were gravid, but the males did not come into breeding condition. Better success was achieved when the animals were kept below 10°C (50°F) for a few weeks. Alan Cann has had breeding success with a winter cooling period at 8-15°C (46-59°F). Most breeders keep the animals in a place where they receive natural light or artifical light that mimics the natural photoperiod. For animals that are cooled under terrestrial conditions, the animals should be warmed up to spawning temperatures slowly, over several days. Feed generously and allow them to enter the water for spawning when they are ready. They will usually enter the water very quickly. 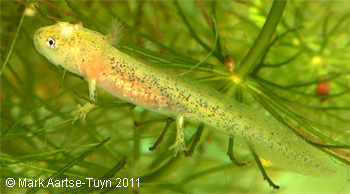 Unlike the other Neurergus species, N. kaiseri have been observed breeding in stagnant pond-type environments. Although they inhabit still water in the wild, captive breeding has generally taken place in aquariums that have some gentle water flow. Courtship behavior generally resembles that of Triturus. Facing the female, the male fans his tail, attempting to maintain his position in front of her. In contrast to the other Neurergus, only the distal third of the tail is fanned. 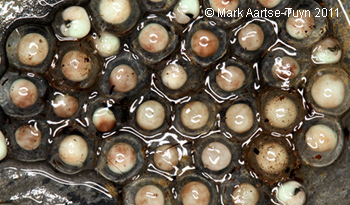 The male then turns away from the female and deposits a spermatophore in front of her. He then moves one body length forward and turns to block her path. If she is receptive, she advances and picks up the spermatophore with her cloaca. N. kaiseri eggs are larger than the eggs of other Neurergus species. In nature, eggs are deposited singly on rough surfaces. Unlike other Neurergus, which ordinarily lay eggs on the underside of stones, kaiseri also use vegetation for laying their eggs. 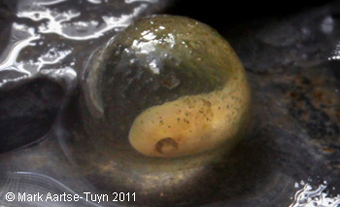 The eggs are laid away from light, but not always on the underside of stones. In captivity, eggs are deposited in many different locations in the tank - on stones, rocks, plants, glass - and many are laid in illuminated areas. Eggs are normally incubated at a similar temperature to that at which they were laid. The larvae are easy to raise and do not ordinarily encounter problems. It is important to feed the larvae Daphnia, Gammarus or other crustaceans in order for them to develop the species' normal orange-red coloration after metamorphosis. 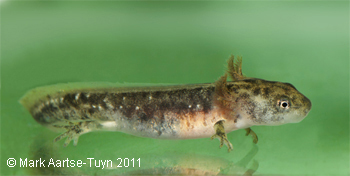 Metamorphosis can be slow, with the juveniles sometimes attaining adult coloration before loosing their gills. At metamorphosis, the animals may move to land. Juveniles can be raised in terrestrial setups, arranged as described above. 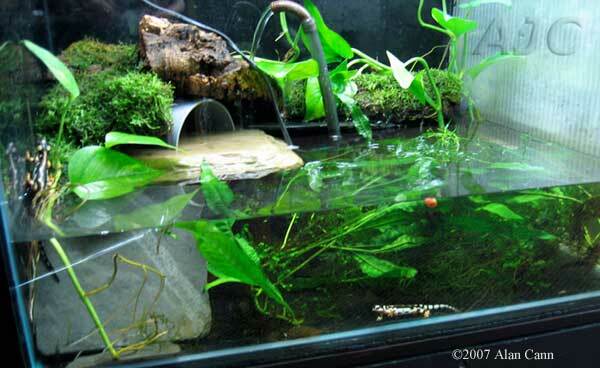 Bogaerts also reports raising them in an aqua-terrarium without problems. Even if they are kept terrestrially, they will often enter water to search for food. Juveniles are generally robust and hardy, with very good appetites. They can grow very quickly, with well-fed juveniles doubling in size in only a few months. In captivity, animals reach breeding size at 2-3 years of age. Schultschik, G, and Steinfartz, S. (1996) Ergebnisse einer herpetologischen Exkursion in den Iran (Results of a herpetological excursion to Iran). Herpetozoa 9:91-95. Sparreboom, M, Steinfartz, S, and Schulschik, G (2000) Courtship behavior of Neurergus. Amphibia-Reptilia 21: 1-11. Steinfartz, S, Hwang, UW, Tautz, D, Oz, M, and Veith, M (2002) Molecular phylogeny of the salamandrid genus Neurergus: evidence for an intrageneric switch of reproductive biology. Amphibia-Reptilia 23: 419-431. ©2008 Caudata Culture. Posted February 2008. Contributors: Mark Aartse-Tuyn, Serge Bogaerts, Alan Cann, Coen Deurloo, and Morg. Compiled by Jennifer Macke.